Looks like a handover of some sort, based on the satchels, the two officers saluting each other, etc., so it’s possible this would be a unit being shipped out of where ever it has been garrisoned. Judging by the flowers in one of the soldiers uniforms, the kids and the architecture, it’s probably in Germany. One soldier have flowers on his uniform. Here’s the reason why “humanizing” the Nazis is important. If you make them out to be inhuman monsters in a way that you can’t relate to, you lose the lesson of history that any people can become them. Before the Nazi party took over Germany, they were just Germans who offered a solution to their political and economic problems to most people. They sold it well, they offered answers that were palatable to a people fed up with the ineptitude and bureaucracy of the Weimar Republic. They fed into nationalism fervor and the “us versus them” mentality in a way that has been repeated since in small doses. If you paint them as monsters, as the boogie man we beat back into the closet and not real people, you fail to teach the lessons of how they came to power and turned the world upside down. If you fail to teach that lesson, then history will repeat itself and that monster will come back and eat you. Hitler was a man, a terrible man, but he was a man who tried to get the people around him to stop smoking, loved his dog, had a family background that mirrors many people today, loved the arts, and tried to lead his country out of the shadow of a terrible war and a poor economic situation. He was seduced by power, racism, and glory and became like a monster the world had never seen. But it is important to understand that he was still a man, and anyone can become like him if they follow his path. The only way to make sure that no one does is to understand why he did what he did, who he was, and where he came from. 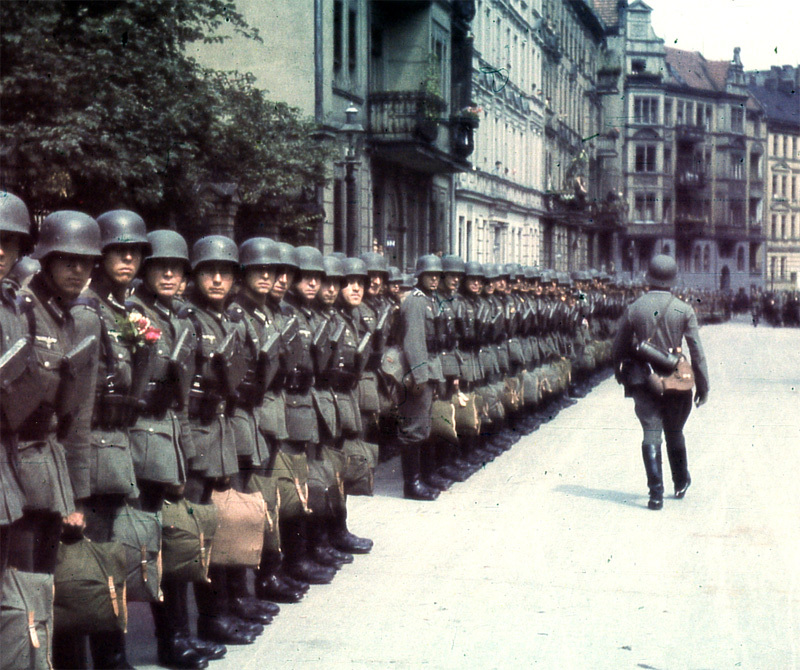 These soldiers are probably with Grossdeutschland. 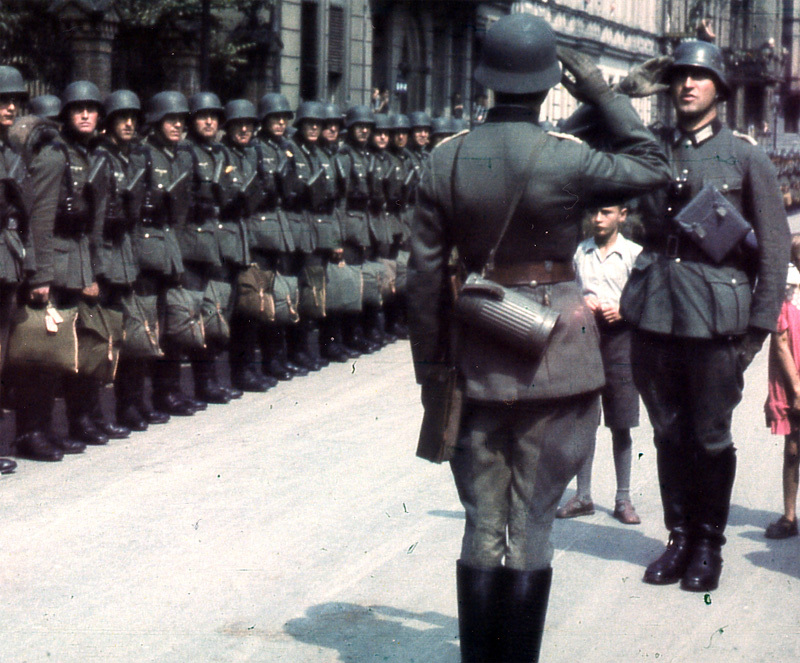 Grossdeutschland uniforms had a silver and green (later silver and black) cuff titles in 1941. See the 12th soldier from the left in the top photo. What would be stored in the metal canister behind the back of the saluting officer in the 2nd photo? The metal canister is for the gas-mask, which each soldier was ordered to carry (but which wasn't used in 99.0% of the battles). Soldiers from all sides still remembered the gas-attacks of World War One and the fear for gas was bigger in this period then later the fear of a nuclear bom in the cold war. Hitler was a brutal killer from his very first days in power, locking up political opponents and subjecting them to torture and murder. To suggest he was just some average Joe who was corrupted by power is simply nonsense.